Dzundwini is a large hill easily seen from a distance since it rises to 601 metres and has a communications tower on it ... called Lion. The meaning of Dzundwini relates to "land cultivated by the chief's people." Dzundwini is south east of Punda Maria. It also marks part of the route taken by Louis Trichard and shortly after by Potgieter and Bronkhorst during the Great Trek in 1836 with their small group. Waypoint 066 marks the turn off to take the climb up to the Dzundzini look out spot on the S58 loop road. The climb takes you t a vantage point 510 metres above sea level and provides a view way into the distance ... overlooking vast Mopane veld. 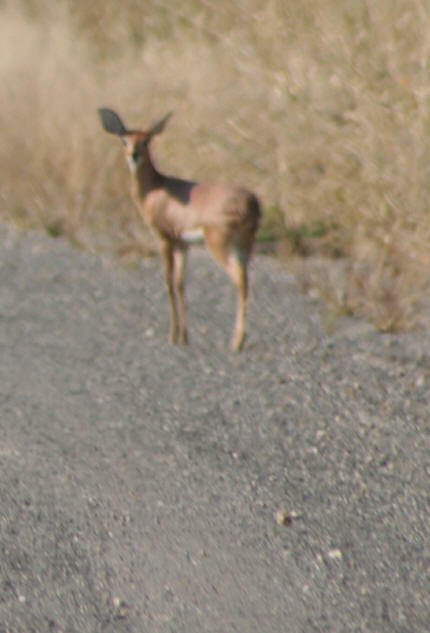 On the way I startled a Steenbok, shown running away and then stopping in characteristic fashion to see if the "chase" is still on. 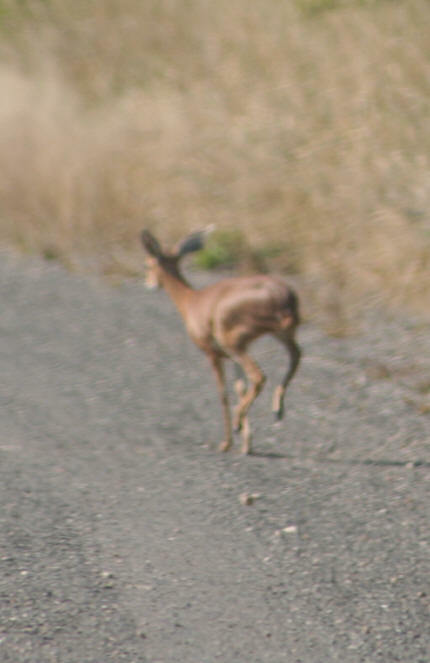 Here's the picture of the startled Steenbok as it runs away only to stop a few metres later to see if I'm still there I suppose. The drive to the top of the viewpoint is a bit stony but is rarely steep. The top is marked by waypoint 067 and here it's possible to see directly south for some considerable distance ... and that's the direction to Shingwedzi. 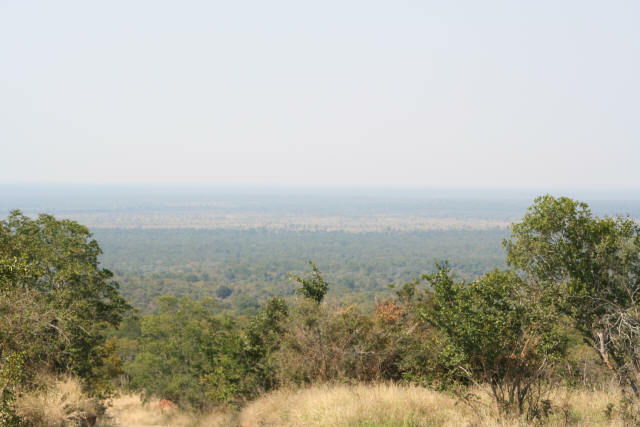 View south overlooking the vast Mopane shrubveld. Take note of the large clearing in the middle distance. The road skirts this area. We mentioned J J Coetser earlier and a borehole named after him close to Punda Maria. This picture of a beautiful shady tree marks the spot of his original camp commemorated by a metal plaque. The Shisha stream which is a tributary of the Mphongolo River runs very close to the tree. The Shisha runs close to the road (H1-7) for part of the journey to Shingwedzi. The Mphongolo is in turn a tributary of the Shingwedzi. The Pphongole and Shingwedzi meet at the "Confluence" which is a beautiful short drive close to the camp (waypoint 078 marks the confluence of the 2 rivers ... I saw a pair of my favourite Kruger birds preening themselves here ... Saddle-billed Storks. Apart for a couple of traffic hold-ups created by an elephant and some zebra (see next picture) the trip to Shingwedzi was uneventful. 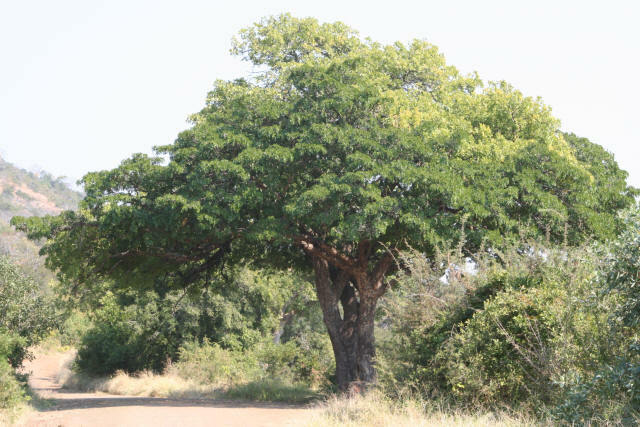 At places the Mopane was broken by some rather beautiful trees. 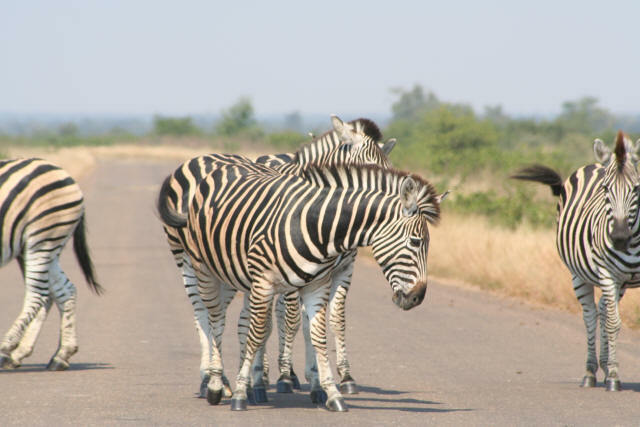 This was a small family group of Zebra holding on both sides of the road on the way to Shingwedzi. Not at all camera shy. Overview of drive down H1-7 to Shingwedzi. 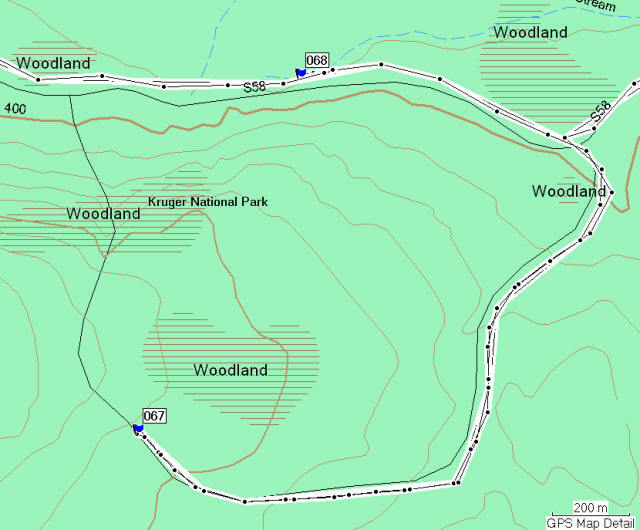 I would come back up the road the next day to complete some interesting side road loops. Waypoint 070 was a short detour to the Makamwa bore hole but nothing was seen. There was also a short loop at waypoints 072 and 073. It was close to here where I got a good photo shot of a White-backed Vulture sharing a tree with a Lappet-faced Vulture . 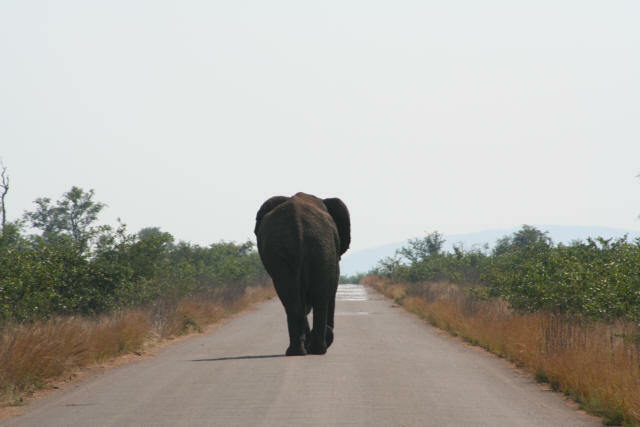 Passed a number of roadside elephants and female Nyala. In addition a Beautiful steenbok. 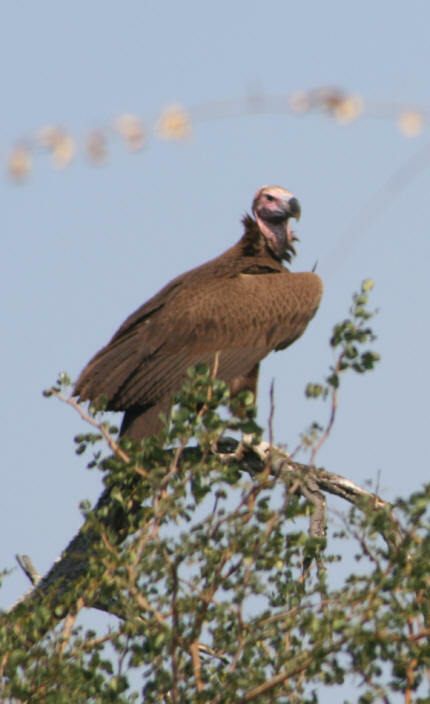 Lappet faced vulture taking a good look around. 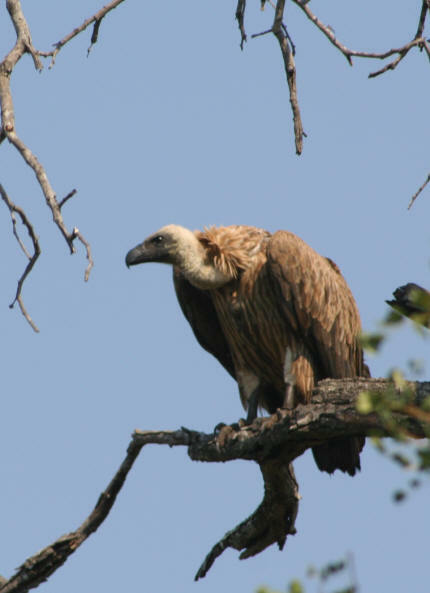 This particular vulture has a very sharp and penetrating beak.